For use In-Store & on the Web! Lammers Stained Glass, Gifts & Antiques Gallery features Eastern North Carolina’s largest selection of quality Stained Glass Panels, Tiffany Style Lamps, Suncatchers and Custom Stained Glass work. With over 8,500 square feet to explore, enjoy and perhaps get lost! 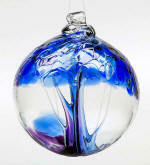 Our unique store is full of surprises, including a huge variety of hand blown glass balls, discs, starfish, and vases, crystal prisms, soy candles, bath and body, glycerin soap, goats milk soap, sterling silver jewelry, gourmet foods & gifts , art glass, equestrian accents, home & garden décor including Corinthian Bells wind chimes, Antiques from A-Z , and a whole lot more. Come See Us, we are located 7 miles north of the Outer Banks Wright Memorial Bridge, on the Currituck mainland. We’re Fun, Funky & You make us Fabulous! As many leaves that are on a tree is as many blessings that we each have in our life. Just as all the leaves combine to create the full leafy top of a tree, so do all of our blessings combine to a full and meaningful life. With care and attention we can brow our blessings and the blessings of others by nurturing, just as we would nurture a tree. The tree of blessings reminds us that there is no blessing too big or too small that doesn’t add to the fullness of life. Every day we are surrounded by many gifts. By taking the time to celebrate these gifts, we are able to feel gratitude for other people or circumstances that allow us to have what we do. Gratitude can come in many different forms, just like the roots of a tree, it can be deep and everlasting. by Showing gratitude to those around us we acknowledge their efforts to make our lives and the lives around them meaningful. Hanging these decorative balls in the window is thought to tantalize evil spirits which may be threatening a home’s tranquility. The evil spirit is mesmerized be the balls reflection. When the spirit touches the sphere it is absorbed and trapped in the web-like strands of glass inside the ball. These beautiful hand blown glass starfish are truly amazing works of art, and make great mementos of a trip to the beach or a special time and place. A functional and whimsical stand that is sure to compliment larger blown glass balls and whatever else your imagination can dream up! Shown with a 6" Tree of Life Ball!. Mermaids are whimsical, beautiful, and fun so adding one of these beautifully handmade stained glass suncatchers to your home window or as a nightlight is sure to just add to the magic you are already creating! 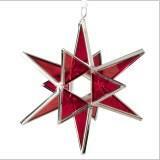 You can hang it in a window, from a stand, or use it as a nightlight!! Angels are strong, loving and always there, helping us along. 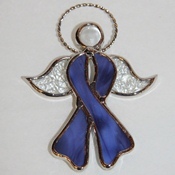 These beautifully handmade stained glass angels serve as a daily reminder of the courage and support that comes from above. 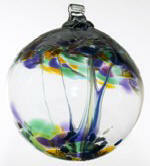 They can be displayed as a beautiful sun catcher or hung on a stand when a window is not available! Looking for "Inspiration"? Well look no further! 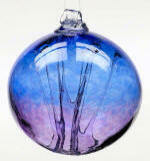 These beautiful one of a kind hand blown glass "Rhombus" ornaments are full of inspiration. Much like life, there are times when we just need to look deeper and be inspired to do so. These brilliant Crystal Chakra Suncatchers are great for bringing some balance into your home, car ,office or any other space that needs color and positive healing energy. These beautiful blown glass vases are the perfect way for you to say "I Love You" over and over. This beautiful and rustic plant hanger is the perfect way to add some equestrian flair to your already stunning flowers and plants! 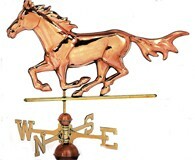 A truly stunning addition to any home, barn stable or even your deck! Show the world how much you love your horses! This adorable Father & Son Cowboy Key Rack is perfect for hanging keys, leashes, and tack. 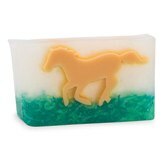 This wonderful almond Horseshoe soap is what you will want to reach for every time you wash. It is also beautiful as a decoration piece in a soap basket. A great gift for horse lovers. All Natural Glycerin Horse Soap The perfect way to wash up after a long ride, with a wild mix of bergamot, lime, and sandalwood. Place them around the house and out in the wash sinks! This beautifully handmade stained glass horse head id the perfect way to accessorize a window with a representation of your favorite companion! Tart cherries and sweet creamy white chocolate combine to bring a new year-round favorite. A cheeseball of course, but also a fun and versatile quick cheesecake recipe as well. You can easily add depth and layers of flavor to any dish with just a splash from the bottle. It's classic blend or tart lemon and smoky garlic goes well with chicken, fish, pasta, and is a vegetarian’s dream sauce! Copyright 2008- 2018. All Rights Reserved.